Above all, it is significant that the English spelling system that emerged from the seventeenth century is not a collection of random choices from the ungoverned mass of alternatives that were available at the beginning of the century but rather a highly ordered system taking into account phonology, morphology, and etymology and providing rules for spelling the new words that were flooding the English lexicon. / Printed texts from the period demonstrate clearly that, during the middle half of the seventeenth century, English spelling evolved from near anarchy to almost complete predictability. 1. The rationalization of the use of final e.
2. The rationalization of the use of consonant doubling, including the use of tch and ch, dg and g, ck and k.
3. The rationalization of the use of i and j, v and u. 4. Resolution of the worst problems relating to the use of i, y, and ie. 5. The almost total regularization of morphemes borrowed from Latin, including those borrowed by way of French. Mulcaster omits d in advance, advantage, adventure, the c in victual, indict, and verdict, the g in impregnable and sovereignty, the n in convent, b in doubt and debt, h in hemorrhoids, l in realm, h in rhyme; he does not use th, ph, and ch in Greek words such as authentic, blaspheme, and choleric. Base-final t becomes c before certain suffixes---impacient, practiocioner, substanciall---and in general Mulcaster's spelling reflects the current pronunciation of words of Latin origin and in part their French spelling. From the list of words Eberhard Buchmann assembled to show the influence of the written language on modern spoken English we can see some of the general rules seventeenth-century scholars followed in restoring Latin spellings: c is restored in arctic, -dict (indict), -duct (conduct), -fect (perfect); a is replaced by ad- (administer, advance, adventure); h is restored in habit, harmony, heir, heresy, hymn, hermit); l is restored in alms, adultery. Other letters lost in French are restored: p (-rupt) (corpse), r (endorse), s (baptism), n (convent), g (cognizance). Greek spellings (following Latin conventions) are also restored: ph in diphthong, naphtha; ch in schedule, schism; th in amethyst, anthem, author, lethargy, Bartholomew, Thomas, Theobald, to cite a few. Buchmann's investigation shows that most of these changes had been generally adopted by the beginning of the eighteenth century; modern pronunciation has adjusted itself to the spelling, not the reverse. 1. The elimination of most ligatures, abbreviatory symbols, and complementarily distributed letters. These spelling variants were eliminated in order to reduce the number of different sorts [type characters] constituting a particular alphabet. 2. Making possible the very wide distribution of texts exemplifying a particular selection of spellings. The English Bibles and Book of Common Prayer as well as certain school books issued by a very few publishing houses (a privilege granted by the King or Queen) may possibly have had an impact on the ultimate preference for certain spellings. 3. The reinforcement of modernizing, standardizing tendencies through the practice of bringing reprints and new editions into line with current spelling practice. 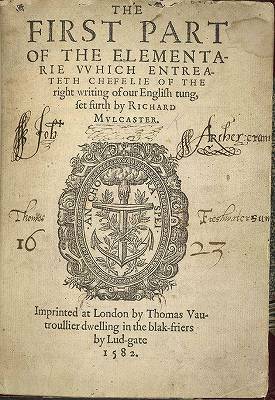 Thus English printers are seen to have played only an indirect role in the process of spelling rationalization that took place during the seventeenth century. In contrast, practically all of the spelling reforms urged by orthoepists and schoolmasters early in the century were adopted by authors during the middle years of the century. It is their effort which resulted in the vastly more rational spelling system that had become standard by the end of the century. The dominant pronunciation now in standard English is /ˈgæsɪəs/. Daniel Jones (1917) recommended /ˈgeɪzɪəs/ (which is now defunct), and gave /ˈgeɪsɪəs/ as a variant, but the pronunciation with initial /ˈgeɪs-/ is now not often heard. ・ Roach, Peter, James Hartman, and Jane Setter, eds. Cambridge English Pronouncing Dictionary. 17th ed. Cambridge: CUP, 2006. I loue Rome, but London better, I fauor Italie, but England more, I honor the Latin, but I worship the English.